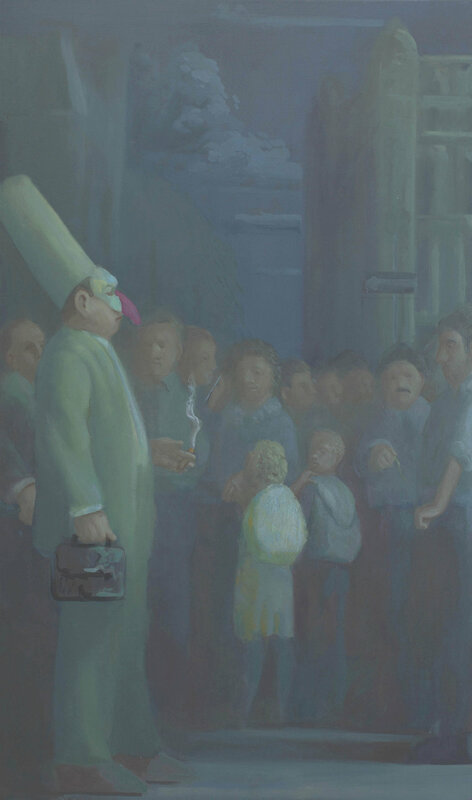 For his last exhibition as a member of the Painting Center Patrick Webb is exhibiting a selection of paintings from a new cycle based on the Tinker Tailor rhyme. The series begun in 2013 will ultimately include 50 plus paintings based on various verses and versions of the rhyme. Inspired by the simple representation of the endeavors described in the text Webb in his paintings explores not only aspects of these activities but also reflects back on 30 plus years of painting and forward to the invention of new pictorial imperatives . Since late 2013, I have been obsessed by the simple rhyme of Tinker Tailor—I love the seeming banality of the list that in verses and versions expands and resonates with associations and confluences. Umberto Eco says we make lists because we are afraid of dying. I agree, and would add we make lists to understand and to make connections. I enjoy the John Le Carré novels that use the rhyme. In them, the characters’ search for information is indirect—the questions asked reveal as much about the questioner as the answers reveal about those questioned. This is how art and the imagination work too—through implication and within ambiguities. So my ubiquitous Punch explores a series of activities. He inhabits the roles of the rhyme. It is a journey of possibility rather than of death and loss. I thought at first I would paint only one verse of 11 canvasses; then the discovery of a second verse precipitated 12 more canvasses. Further research revealed a third version that added another 19 characters bringing the series to 42 paintings. Then I had to write my own list, my own libretto, and now I am planning 60 canvasses. The sequence, like many of my recent series, is malleable—interchanging the placement of the paintings brings to light new connections, possible narratives and causalities that underscore the niggling strangeness of life, with its interconnectedness and unknowability. The exhibition opens October 6 and goes through October 24. A reception for the artist will be held October 8, 6-8 PM A catalog of the first 23 canvasses will be available with notes by the artist and Jonathan David Katz curator of the exhibitions Hide/Seek: Difference and Desire in American Portraiture and Art AIDS AMERICA.